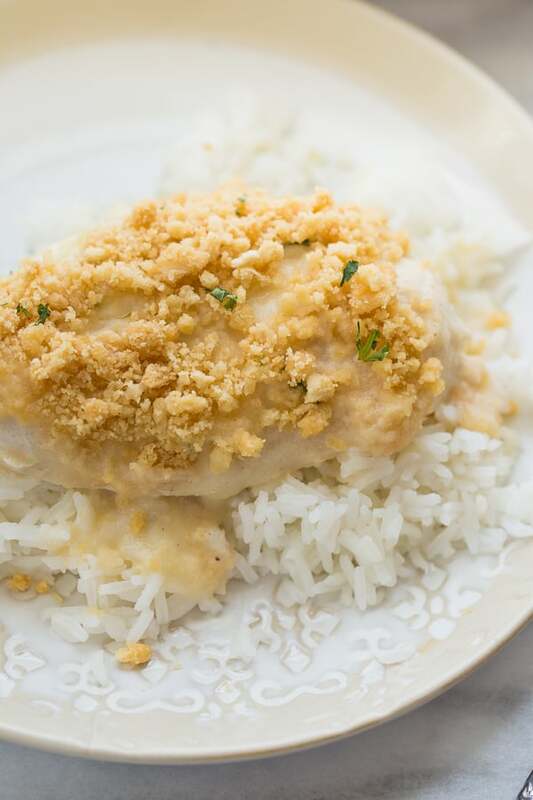 Gluten-Free Swiss Baked Chicken! 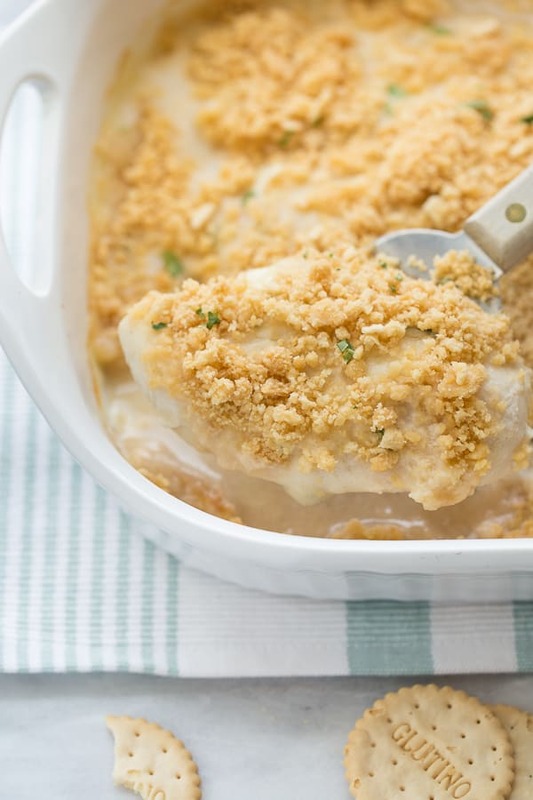 Cheesy, creamy chicken topped with buttery cracker crumbs. A comfort-food casserole made gluten-free! When fall comes around it’s time for cozy dishes and comfort food casseroles. 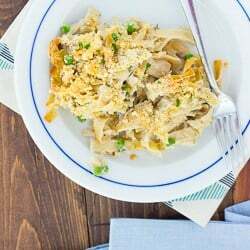 This Gluten-Free Swiss Baked Chicken is a classic casserole turned gluten-free thanks to an easy, homemade cream of chicken soup. The homemade “condensed soup” is super easy to make with chicken stock, gluten-free flour, milk and pantry spices. It would be delicious in all kinds of recipes that usually call for condensed soup! For this casserole, I like to cut bigger chicken breasts in half lengthwise to make thinner chicken cutlets. The thin slices of chicken are placed in a the baking dish, topped with slices of Swiss cheese then covered in the sauce. 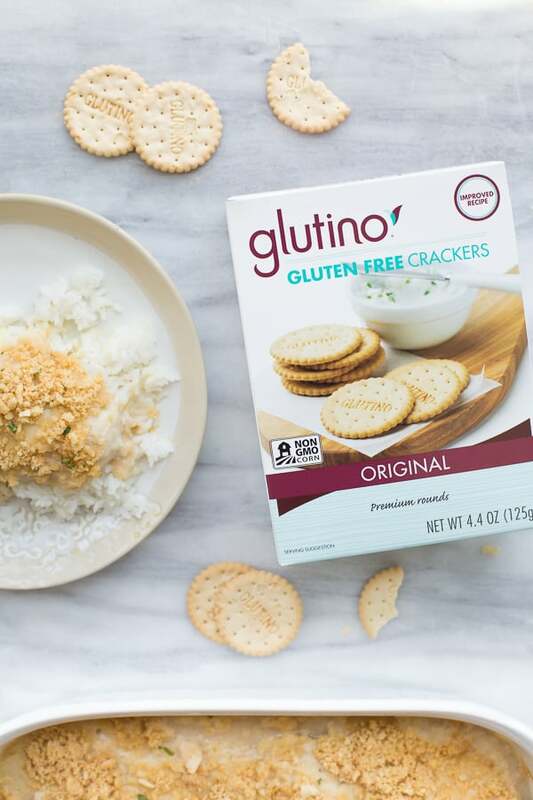 This Gluten-Free Swiss Baked Chicken is also topped with buttery Glutino gluten-free cracker crumbs. 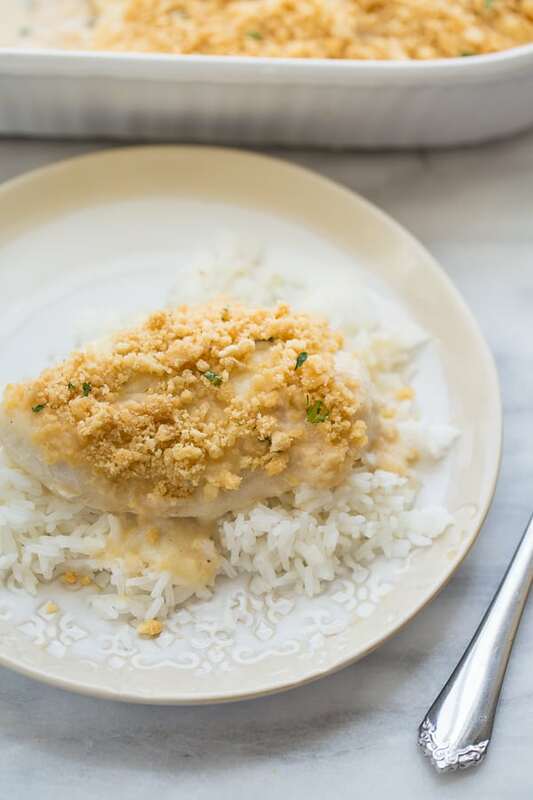 They add the perfect crunch to the cheesy, creamy chicken! Around the holidays I’m always looking for easy, crowd-pleasing dinners to feed family and friends. 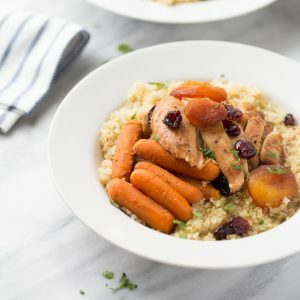 This chicken dish is undetectably gluten-free and delicious for both gluten-free and non-gluten-free eaters alike! 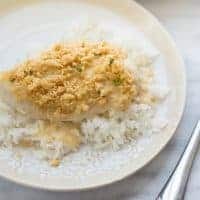 My kids also love this chicken because it is topped with cheese and buttery cracker crumbs. It is delicious served over rice, mashed potatoes, or gluten-free pasta! Preheat the oven to 350 F. Lightly grease a 9×13 pan with cooking spray. In a medium saucepan, combine the chicken stock, salt, pepper, onion powder, garlic powder, poultry seasoning and paprika. Bring to a simmer over medium-high heat. Whisk together the flour and milk, then whisk into the hot stock. Cook for 2-3 minutes until the mixture bubbles and thickens. Remove from heat and set aside. Place the chicken in a single layer in the prepared baking dish. Top each piece of chicken with a slice of swiss cheese. Pour over the sauce. Cover the baking dish with tin foil and bake for 20 minutes covered. While the chicken bakes, place the crackers in a large ziploc bag. Using a rolling pin, crush the crackers into crumbs. Add the melted butter and mix to combine. After the chicken has baked covered for 20 minutes, removed the tin foil and top with the cracker mixture. Return the chicken to the oven and bake for another 20 minutes, uncovered, until golden and bubbly. Serve over rice, gluten-free noodles or mashed potatoes. Enjoy! 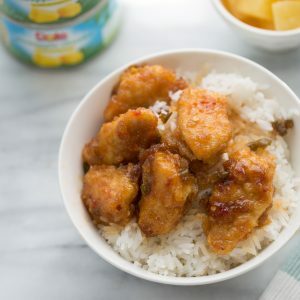 Can I make this recipe non-dairy as well as gluten free? This is a delicious recipe. Perfect for feeding a crowd. I can’t believe how much flavor is in this meal- creamy, buttery, and cheesy!